First, a general disclaimer: I received an uncorrected proof of this book through the publisher. I am not being compensated in any way for this review. All of the opinions expressed here are my own. 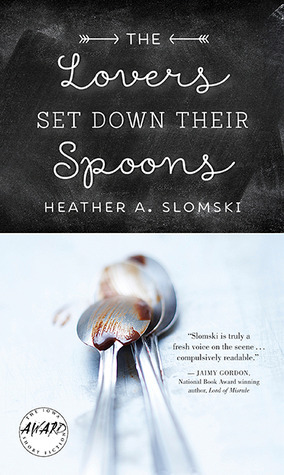 The Lovers Set Down Their Spoons is Healther Slomski’s first published work and the winner of the 2014 Iowa Short Fiction Award. It is a collection of fifteen short stories of varying lengths that examine the delicate nature of human relationships and the ways in which we deal with loss. Slomski’s work joins reality with the surreal. In the title story, we are sitting in a restaurant observing two unfaithful couples coming together to acknowledge their shortcomings. Two stories later, we find ourselves engrossed in the tale of a store mannequin’s lost love. Loss remains a consistent theme throughout, but the stories always seems to be accompanied by hope. The first story in the collection, the title story, gave me the warm feeling of a second chance despite the chaos the characters find themselves in. The last story, “Before the Story Ends,” was effectively able to reduce me to tears, which is a rare occurrence. Despite all of the sadness, the last line was eerily uplifting. Slomski writes beautiful, flowing prose with many quote-worthy passages. It doesn’t feel as though she is trying hard to impress us, and I love that she could take situations that seem so mundane and turn them into something magical. However, the endings she chose for a few of her pieces left me frustrated. I don’t always expect closure when a story comes to an end, but some of Slomski’s last lines felt abrupt and unfinished and wanting something else. I understand that this is a stylistic choice and that many readers love it when endings are left wide open for interpretation. It just doesn’t work for me personally. That’s not to say I appreciate her work less. It’s just a difference in technique. Bottom line: yes, I do recommend this book to anyone who appreciates literary short fiction. I give it 4/5 stars and will be looking forward to any future publications. The Lovers Set Down Their Spoons won’t be released until October, but it’s available for pre-order here.